In case you didn’t notice, there is a big discussion going on whether or not Google is pushing their own properties too much. 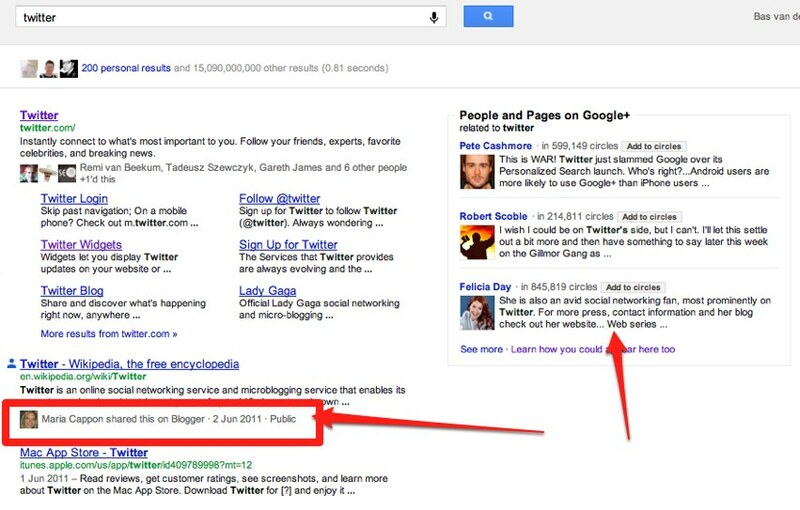 And with the new “Search Plus Your World” that discussion focusses mainly on Google+. And with reason, because the suggested users in the right pane are all Google+ users. You would expect those users to be, to say the least, active on Google+. But as pointed out before on other blogs, people like Mark Zuckerberg still are suggested even though they don’t actually use the service. This however is not a real big surprise, because it is about relevance and Mark Zuckerberg is relevant to the search term “Facebook” so it kind of makes sense. They should however maybe also show his Facebook account, but that is the discussion and I don’t want to focus on that here. There is something else. Suggested connections do not only turn up in the right pane, they also show up underneath ‘regular’ search results. And it seems the connection doesn’t have to be relevant or because of Google+. Now the fact that somebody shared that link and that it is showing on in the results is nothing special, but that usually comes from people I know. In this case, I don’t know that person. If I mouse over the name I get more information: she is a suggested connection! Now that is interesting. So suggested connection are not only appearing in the side, they can also be appearing in the actual results. There is something else about the suggestion though. First of all: she actually hardly even uses Google+. Now that doesn’t have to be an issue as we’ve seen with Mark Zuckerberg, but in this case she is not the authority on the subject Twitter, something you would expect if somebody was suggested here. It turns out she is part of my social circle. She is connected to somebody I know. So Google picks up on not just relevance, also on social circle. So it is not just about being on Google+, it is not just about sharing content on Google+ and it is not just about high relevancy. It is also about your social circle. Who Do You Think Is Right? Google or Twitter?